It’s 11 p.m. and it looks like these two little cuties aren’t going to make it. Waiting for Santa is tiring work. 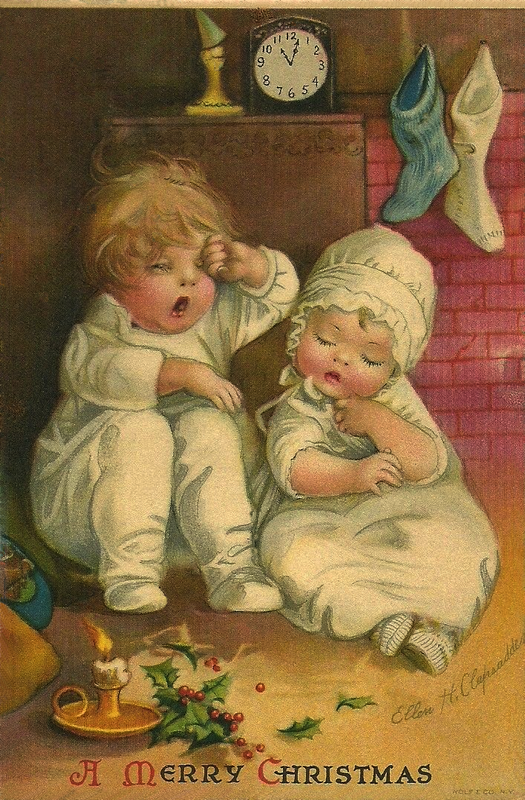 Ellen H. Clapsaddle (1865-1934) was an American artist most well-known for her postcard designs. She began her career after sending two designs to the International Art Publishing Company in New York City. She, along with the Wolf Brothers of Germany, created their own publishing company, the Wolf Company, a full subsidiary of International Art. This was the Golden Age of the Postcard. As many as 1/2 billion Clapsaddle designs were printed onto postcards. Clearly, even over 100 years ago, they were much loved. Thankfully, there are many of her cards still available. Oh my, aren’t these two wee ones so cute? It’s only a little past 11 but I don’t think they’re going to make it. The little girl, with her sweet eyelashes, is already asleep. Her slightly bigger brother is yawning and rubbing his eyes; fighting to stay awake. Looks doubtful that he’ll catch the jolly old elf when he comes down their chimney. Their empty stockings are hanging from the fireplace; ready for Santa to fill them with goodies. A single candle sits at their feet with some holly leaves and berries. Off to the left, just out of view are a plate of cookies waiting for Santa too. Not much more to say other than here’s hoping these two wee ones can be part of your Christmas Day. If you would like a larger version of this vintage Christmas illustration, just click on the picture shown above.